Although we are an open company, we've held some secrets back: we've tried to keep the appearance of the final PR2 robot under wraps. Part of that is because we are still tweaking some details and don't want to confuse people with non-final renderings, but part of it is also so that it will be a fun surprise when the first PR2 beta robots roll off the line. Last week we started selecting the colors for the PR2 beta robots, so it's fair to say that the design process is coming to close and we have a better idea of what the robot will look like. While we won't fully divulge what the final robot design (we like our surprises), we let the cat partly out of the bag with some photos that have been going out to media publications. It's only fair to share those here with you and also talk about some of the new details that you see. The photo above is still a PR2 alpha prototype, but regular visitors may be wondering what that row of six lenses is. 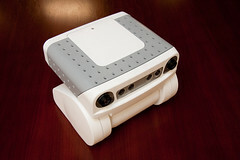 That's a mockup of our sensor head that will be shipping with the PR2 beta robots. 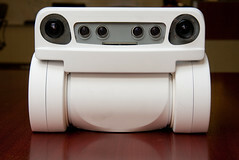 Our PR2 alpha robots have not had a sensor head design. Instead, the PR2 alpha head is just a grid of bolt holes that have allowed our researchers to experiment with different sensors in order to determine what will ship with the PR2 beta robot. This has meant that the PR2 alpha robots have been a bit more "rugged" looking -- we've referred to one of the robots as the "Mad Max" robot because it looks like it's been stealing sensors off of other robots. Our first two milestones stressed the sensing capabilities of the robot and have given us time to develop our own sensors to support bleeding-edge perception research. With a Hokuyo UTM laser on the base, a tilting Hokuyo UTM just below the head, and two wide-angle cameras in the forearms, it was up to the sensor head to fill out our remaining sensing needs. We knew we would need stereo cameras to support algorithms like Visual SLAM as well as finding door handles, plugs, and other objects. We would also need a camera that could provide higher resolution images. After testing various high-resolution cameras, we settled on 5-megapixel Prosilica cameras for their simplicity, global shutter and resolution. For stereo, we settled on two stereo cameras: one color and one mono. The mono camera's 1-2ms exposure is synced with the LED light projector that projects a static pattern, providing the stereo camera with improved texture for feature matching to give you much better 3D data from the camera. The rest of the cameras are 'anti-synced' so the pattern does not show up in their images. The LED pattern projector was developed in-house and works in combination with the mono stereo camera to give back high-quality 3D shapes. This will be critical as researchers use the PR2 to manipulate objects on tables. For the physical design of the sensor head, we consulted with a broad range of people. Our researchers gave us feedback on various mounting options for the final sensor head, which mainly boiled down to, "More bolt pattern!" We considered a wide range of sensor arrangements, some of which we included below, and we worked with a color expert to see how color and shapes affected how the sensors were perceived. We also conducted surveys on Mechanical Turk to understand how others would react to them and consulted the human-robot interaction design literature, where we learned that robot heads that are wider than they are tall are perceived as being less human-like. This helped us to rule out tall head designs that would encourage unreasonable human-like expectations of PR2. Our designs converged on the layout with the four stereo camera lenses combined into a single unit in the middle and the two larger lenses on the outside. We finally moved the stereo camera lenses lower than the others after seeking some inspiration from the Mini Cooper headlight designs, which are both mechanical and approachable. The problem with this layout is that this combined stereo camera didn't exist. A custom stereo camera was developed with Videre Designs to adapt existing designs into a new combined sensor that interleaves the mono and color cameras in a single package. We sent all this feedback to our industrial designer who was able to take these broad range of requirements and distill them into a cohesive design. We worked through several iterations of sketches, which led to CAD models, which then led to this foam mockup, where we tested how faceplates would affect the appearance of the robot. The mockups are important as sketches and 3D renderings have trouble capturing what something looks like in person. Based on this foam mockup, we made some more modifications and produced the mockup you see in the first photo. Orders are now being placed for the real parts and we're looking forward to seeing the final product. As you can see, there's still plenty of bolt-hole pattern so you can continue to do the same sort of research we did in finding the best sensors for the job. Submitted by Anonymous on Sat, 07/04/2009 - 04:44. Is there really any need for separate color and mono stereo cameras? You could easily extract luminance from color images. Submitted by admin on Sun, 07/05/2009 - 11:22. Thanks for the question. The cameras serve different purposes -- the color is wide-angle. The mono is narrow-angle and is used in conjunction with a red pattern projector (hence, no need for color).